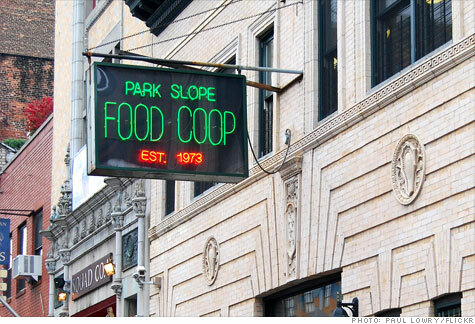 The Park Slope Food Coop (PSFC), the largest consumer-owned single-store coop by sales in the U.S., had $39.4 million in sales during its last fiscal year, raking in more than $6,500 per square foot annually. "Anyone would salivate at that," says Ann Herpel, a general coordinator at PSFC. In our recent story on Trader Joe's we noted that the successful Monrovia, Calif.-based chain outdoes it competition with an average of $1,750 in sales per square foot, more than double those of Whole Foods (WFMI, Fortune 500). Traditional supermarkets should pay attention, and not just to those stellar financials. Under the coop model, the owner and the consumer are one in the same. "A coop has to make money but also has to have the best interest of its owners, who are also its shoppers, at heart," says Robynn Shrader, CEO of the National Cooperative Grocer's Association (NCGA). As a result, as PSFC notes on its site, it is "responsive to the membership rather than to the companies trying to sell their products." Because coops don't need shareholders or executives to back initiatives, they answer customer-member demands quickly and are often ahead of national trends. Take grocery bags -- PSFC stopped handing them out (both paper and plastic) altogether two and half years ago. When PSFC was founded in 1973, its member-only, member-run coop structure wasn't that unusual. But as other coops have abandoned their labor requirement to increase membership and up sales numbers, experts say, PSFC is now the only coop in the country of its size where all members are required to work and only members can shop. But that doesn't mean PSFC is exclusive. The only requirements for membership are a $100 deposit, a $25 processing fee, and attendance at an orientation session. Dave Gutknecht, editor of Cooperative Grocer, notes that PSFC has been able to maintain its model partly because of the density of the local population. In addition to 65 full-time employees, its 15,100 members give 2.75 hours of labor every four weeks in jobs that include working in the child-care center, cutting and wrapping cheese (a big money saver), and walking customers to their homes or cars with shopping carts. While some coops have tiered memberships -- i.e., you pay more not to work -- the coop only has one level of membership to keep it egalitarian. The two biggest expenses for a grocer are labor and the cost of goods. But PSFC's members provide about 75% of the store's work, which translates into big savings. The PSFC estimates that shoppers spend 20% to 40% less on their grocery bills than they would at a traditional supermarket. Gutknecht says that PSFC operates at a lower margin than any other conventional coop, which yields lower prices. It marks up products 21% over the cost of the goods delivered, for a gross margin of 17%. "The volume makes it work," says Herpel. The coop handles so much money that it deposits its cash in the bank every two hours for security reasons. Similar to Trader Joe's or grocer Stew Leonard's, the Food Coop has a limited selection of items (9,500, vs. about 50,000 in a typical supermarket) in a relatively small store footprint (6,000 square feet), which allows it to buy in bulk and produces a high turnover on goods. Herpel says that the Coop turns over its inventory 60 or 70 times a year. PSFC covers most food categories even though it sells only several thousand items, which sets it apart from a specialty food store. Much like a Trader Joe's, which also doesn't use slotting fees, goods are on the shelves because members want them, not because manufacturers essentially rent shelf space through extra charges. The store can therefore capture most of the money its customers spend on food in any given week. Herpel says that when Trader Joe's came into town, she expected members would leave the coop, but its numbers have remained steady. Gutknecht says that's because when a Trader Joe's or Whole Foods enters a market, a coop can sometimes benefit. "The shopper gets exposed to organics and then wants more -- more information, selection, and confidence." That may be the biggest draw for some members of PSFC. One of the loudest complaints Fortune heard from Trader Joe's shoppers: They don't know who's making many of the chain's branded products or where they come from. PSFC tries to be as transparent as possible, listing its suppliers on its site and the farm of origin on the label in the store. It buys local whenever possible. Say you buy beef at PSFC. You're purchasing part of a whole cow that the coop buys every week in upstate New York and has slaughtered. Competing grocery stores could brush aside PSFC as a one-off success story. And although it is true that its scale is rare, consumers are signaling that they want this type of shopping experience. Gutknecht noted that there are now 200 coops in startup mode, which is the largest number since the 1970s. "That's a huge wave," he says. So don't be too surprised if you see a coop popping up in your neighborhood one of these days.